Darwin Chorale performed Christmas Fantasia at Christ Church Cathedral 16 Dec 2017. 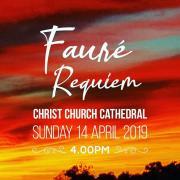 With approx 50 singers accompanied by a string orchestra, Michael Loughlin, Music Director, again led the Darwin Chorale in the ambient surroundings of Christ Church Cathedral. The audience particularly enjoyed Ralph Vaughan Williams' Fantasia on Christmas Carols, which included several well known carols threaded through the piece and featured baritone solo, bassoon solo and full choir. Other highlights include a trio from the Mozart opera Cosi Fan Tutte and Vivaldi's short choral work Beatus Vir (Blessed is the man). A special feature of the concert was a performance of Vivaldi's flute concerto The Goldfinch by local flautist Roslyn Perry, accompanied by the string orchestra. The concert concluded with a rousing rendition of the much-loved favourite the Hallelujah Chorus from Handel's Messiah. 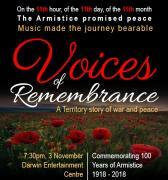 Darwin Chorale sings at the 76th Bombing of Darwin commemorative service at the Darwin Cenotaph. Members of the choir participate every year in this commemoration.